Pros: Fantastic music helps this show stand above other pantos. Cons: Some of the silliness is a bit jarring until you get into the swing of things. It’s been a long time since I’ve seen a pantomime. In fact, Billy the Kid is the first I’ve seen as an adult, and as the show began, I quickly realised that pantomimes are harder when you’re grown. You have to forget about being serious and grown-up. You have to abandon your reserve, reservations and pretentions. You have to let yourself appreciate the silly, the juvenile, the unabashedly over-the-top. And you have to get involved; start hissing at baddies, singing along with the songs and shouting ‘Oh no it isn’t!’ at the stage. All in all, you have to be an active and enthusiastic audience member; you can’t just sit at the back watching and judging like with other theatre. Luckily, Billy the Kid showed me that if you can do that, you’ll have a load of fun. Charles Court Opera‘s Billy the Kid is being shown at the Rosemary Branch Theatre above the Rosemary Branch pub near Hoxton. It’s a lovely example of a pub-theatre; warm and welcoming downstairs, cramped and intimate upstairs, with a suitably crooked staircase in between. It did get almost unpleasantly hot upstairs as the performance progressed, but on the other hand, the small room made for an intimate, raucous atmosphere. 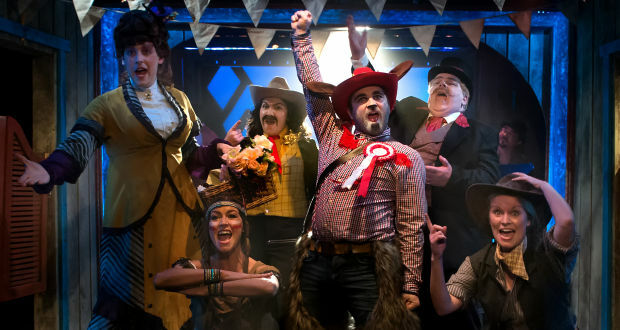 Billy the Kid has all the classic pantomime elements; an over-the-top villain, cross-dressing characters, sweets being thrown into the crowd, sing-alongs, groan-inducingly cheesy one-liners and bucketfuls of innuendo. If it took me a while to get into the joyful silliness of it all, that’s probably more of an indictment on myself than the show. 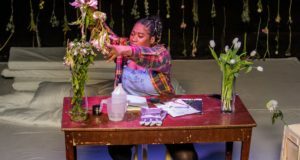 The performance was full of energy and excitement; it was a whirlwind of singing, dancing, intimate chats with the audience and gag-filled dialogue between the characters onstage. Overall, it’s all a bit silly. For example, a woman dressed as a man serenading a man dressed as a woman while recreating the famous potting scene from Ghost sounds pretty ridiculous. And it is ridiculous. But it’s also really good. Not just because it’s funny and fun (which I appreciated more and more as the evening carried on) but because the cast can sing brilliantly. Whilst the lyrics and acting are comic, the music itself is simply superb. 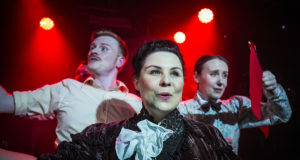 Most of the songs are adaptations of famous tunes, and a lot of the genuine humour comes from how these have been cleverly twisted and adapted to fit the performance. 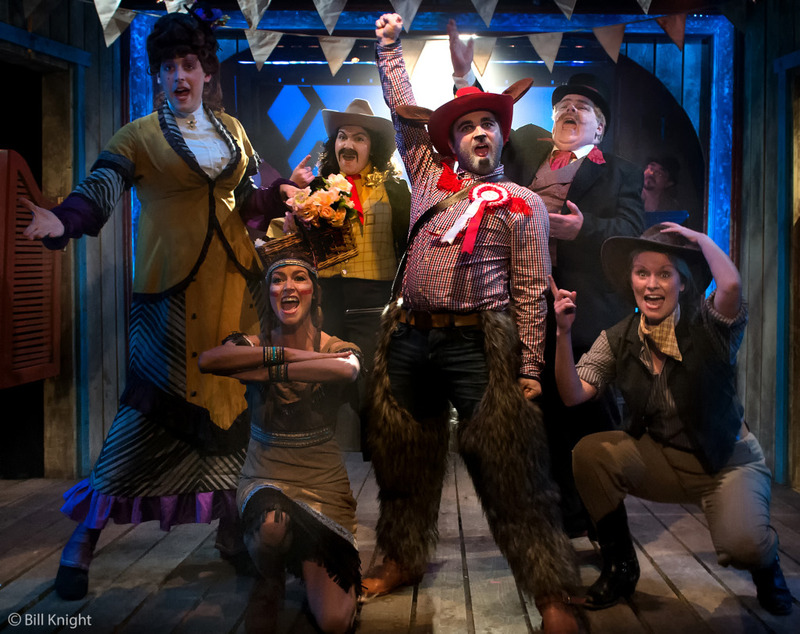 As the name suggests, Charles Court Opera are actually an opera company, and the entire cast have fantastic voices. The other aspects of the panto are enjoyable, but it is the cast’s musical ability that raises the production to another level. The energy and enthusiasm of all the actors was infectious and by the end of the show, the atmosphere in the small theatre was joyful and jolly. As befits a panto, the ‘dame’ (played by director John Savournin) was the star of the show. And the only faults I can really find with the production are more about the genre than this particular show. Some of the cheesy one-liners were a bit tedious, and the evil villain was too over-the-top for me. The frequent secret soliloquies during which he explained his evil plans in Rupert Bear-esque rhymes got a bit much for me. And then there’s the dreaded audience participation. Whilst I found it very funny to watch, I think I would have felt differently if I’d been seated at the front and picked as a ‘volunteer’. As everyone filed down the narrow staircase for the interval, I overheard someone say with relief ‘I’m just glad I didn’t get cream-pied or made to milk a buffalo,’ which pretty much sums up my feelings on the matter. I think the danger of panto is that it could easily become crude and cheap – something sordid rather than something silly. And while Billy the Kid isn’t lacking in innuendo, it is never unpleasant. Mostly it is pure, unabashed fun. As I found, you just need to relax and appreciate the silliness of it all.